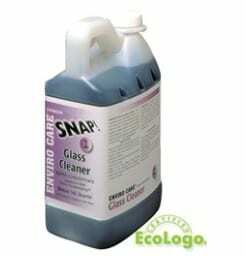 Window Washing and Glass Cleaner Click or dial (720) 746-0803 for SNAP EnviroCare Glass Cleaner to easily obtain shiny, streak free and clean windows. Non-streaking Glass Cleaner is a concentrated solution that leaves windows, mirrors, and all other polished surfaces squeaky clean and free of streaks and hard water deposits. It is highly effective, even on heavily soiled surfaces. EnviroCare Glass Cleaner is recommended for cleaning glass, mirrors, porcelain, enamel, stainless steel, chrome, Formica, plastic and ceramic tile and other polished surfaces. This can be applied to the surface to be cleaned with a sprayer, clean cloth, sponge, or window cleaner applicator and removed with a clean soft cloth or squeegee. This product meets EcoLogo Environmental Standard for Hard Surface Cleaners (CCD-146) based on its low impact for human and environmental health. This is a super, super concentrated product. Packaged for the high volume user. While the most environmentally friendly and sustainable packaging available is leveraged, this requires the use of a SNAP Dispenser. Dilute with cold tap water. Each half gallon SNAP container makes 40 gallons or 160 quart bottles. This super concentrated product saves you money. Use with Spray Bottle for EnviroCare Glass Cleaner.